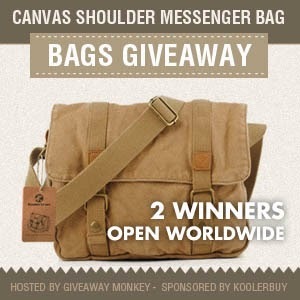 Welcome to Canvas Messenger Bag International Giveaway brought to us by KoolerBuy. 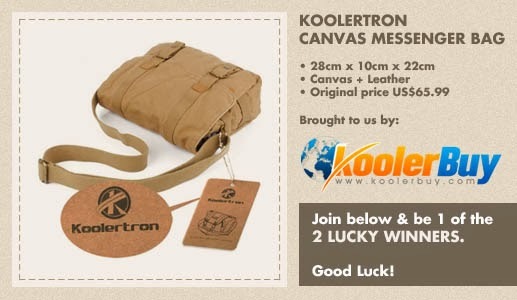 Giveaway Monkey has partnered with KoolerBuy to give away new Koolertron Canvas Leather Shoulder (Messenger) Bag to two (2) lucky winners! I would love to add this bag to my humble collection of bags. I would find it handy most for when I go back to school I think. What would you use it for? Enter for your chance to win one of the two bags by filling out the rafflecopter form below. Open worldwide (KoolerBuy ships internationally). This giveaway will run from March 3, 2014 through March 21, 2014. Good luck! I love the Koolertttron Canvas backpack! My husband would love this light. They have so much stuff! I would love to have the Koolertron Leather Case Wireless Bluetooth Keyboard for Apple iPad 2 The New iPad 3rd Generation. I really like the mens vintage koolertin messanger bag. I like the canvas rucksack. Am vegan so like that there is no leather. I'd love to have the yo-yo I tweeted about at https://twitter.com/mdkennedy63/status/444871653319647232 - loved them when I was a little girl! I love the Koolertttron Canvas messenger bag! My son just started photography so the Koolertron Waterproof Vintage Fashionable PU Leather DSLR Camera Bag would be perfect! Koolertron F2002 Yellow Canvas DSLR SLR Camera Shoulder Bag Backpack Rucksack Bag with Waterproof Rain Cover. Oh a water proof camera case would be cool!